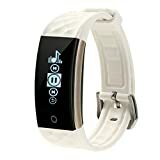 Multifunction: dynamic heart rate monitor, steps, distance, calories burned and active minutes tracking, intelligent alarm clock, sleep monitoring, sedentary reminder, call message reminder, shake to take photograph. Cycling Record: select the bike icon in the clock, press the clock 2 seconds to activate the driving state, and then you can set your driving calories consumed and the duration of the recording. If you want to record your journey, you must use the app from your smartphone. Please select the options from the APP “Outdoor”. Four kinds of indoor sports mode: Rope Skipping, Jumping Jack, sit-ups, Treadmill. Even if it is the windy and rainy weather, it also can also help you to record movement data and exercise consumption of fat in the gym. Compatible with: Android 4.3 and later / iOS 7.0 and later, Bluetooth 4.0 AND Install the APP tape on the smartphone, scan the QR code in the manual or search for the app “SmartWirstBand” in the application market. 1. Display Health Parameters: this smart wristband can display the time, date, dynamic heart rate, steps, distance and calories clearly. Let you know your sports data immediately! 4. Sleep Monitor: are you curious about your sleep quality? Sleep monitor function will provide you the answer. 5. Alarm Clock: don’t be afraid that your alarm would wake up others because this vibration function just wake you up!